They hadn’t actually seen each other because the whimsy of wind and distance was playing cat and mouse with the favorable airflow of a fortuitous path crossing. While minding the meandering momentums of the day, a mutual, steadfast spirit stayed true and led them to this marvelous moment of a simple handshake. That is honestly the best compliment I could ever imagine. I cannot Thank You enough for such a thoughtful and wonderful comment. I truly appreciate it. I was wondering about the silence. Might have missed one or two posts. Beautiful as always. Thank You so much quiall. A simple handshake…marvelous, indeed. I love this. I’m pleased you enjoyed it. Thank You so much. i believe it is always a ‘special’ moment when a butterfly ‘chooses’ to make one’s acquaintance – i particularly applaud the use of the word ‘mutual’ – with this additional element, you have eloquently and elegantly captured a very unique and precious moment – of which it truly is. Your overwhelmingly kind and very thoughtful comments are themselves both elegant and eloquent. Thank You very much for such humbling and wonderful words. The words carry the beautiful contrast, at the same time intimate closeness of the butterfly’s delicate wings against the aged hand, and give it a deeper meaning. I truly appreciate your perspective. Thank You so very much. 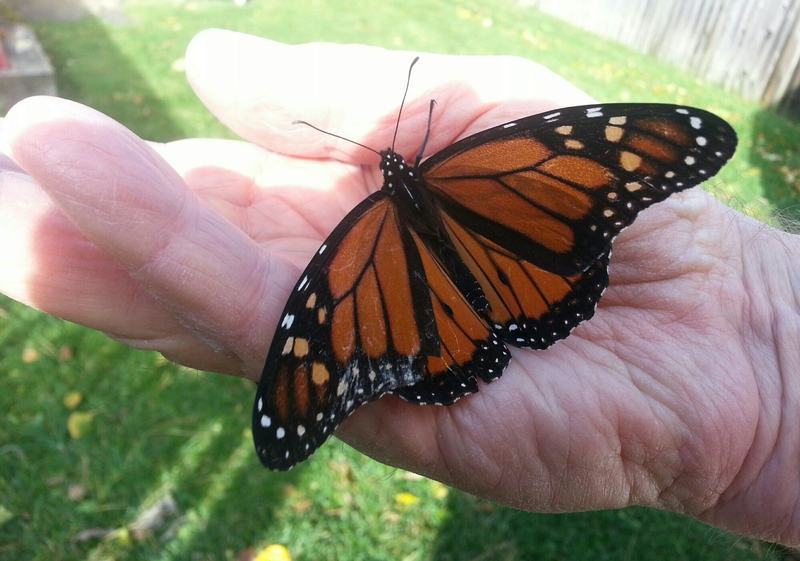 Oh, I love this, the open hand…the beautiful butterfly lighting peacefully. Lovely. I’m glad you like it. Thank You so very much. I am completely in love with your blog concept and so happy that I found it! My phone was 2″ away from my Dad’s hand. Thank You so very much. Thank You. I truly appreciate your kind words. I thoroughly appreciate your wonderfully thoughtful words Amy. Thank You so very much. Amy, you have energized me with your kindness. Thank You & Thank You! So lovely. It reminds us of our (frequently forgotten) connection with nature. Thank You so very much Sandy. I truly appreciate your wonderful thoughtfulness. Wow you must smell really sweet to attract this beauty wow! This is the only one I have seen this year. I even have 3 butterfly bushes and all they did was attract gigantic bees and hummingbirds! 😀 What’s your secret? I am 2″ away from my Dad’s hand with my phone. Very fortunate shot to say the least. Thank You Michelle.